The Bills have agreed to terms with Kroft (foot), Ian Rapoport of NFL Network reports. Kroft underwent season-ending foot surgery Friday and will be placed on injured reserve, Ian Rapoport of NFL Network reports. Analysis: Kroft missed the Bengals' past four games due to a fractured right foot and had yet to resume practicing since suffering the injury. His limited progress prompted the Bengals to send him in for the procedure, making Kroft the team's fourth tight end to land on IR this season. Cincinnati signed linebacker Brandon Bell off its practice squad to take Kroft's spot on the 53-man roster. Kroft (foot) has been ruled out for Sunday's game against the Ravens, Paul Dehner Jr. of The Cincinnati Enquirer reports. Analysis: Kroft has yet to resume practicing since fracturing his right foot Oct. 7 against the Dolphins, so it comes as little surprise that he'll be sidelined for a fifth straight game. With Kroft out of the picture for another week, Matthew Lengel is expected to act as the top backup to starting tight end C.J. Uzomah, who has been handling the overwhelming share of the offensive snaps at the position for more than a month. Kroft (foot) isn't participating in Thursday's practice, Jay Morrison of The Athletic reports. Analysis: Kroft hasn't been officially ruled out for Sunday's game in Baltimore, but with back-to-back absences at practice Wednesday and Thursday, it appears safe to conclude he won't be available this weekend. 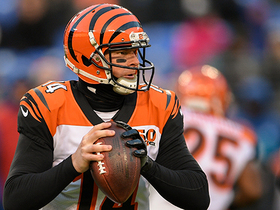 The 26-year-old has missed the Bengals' past four contests, allowing C.J. Uzomah to seize control of the starting tight end role following the season-ending injury to Tyler Eifert (ankle). Kroft (foot) didn't practice Wednesday, Paul Dehner Jr. of The Cincinnati Enquirer reports. Analysis: Kroft hasn't shown much sign of progress in his recovery from a fractured right foot and looks like a long shot for Sunday's game against the Ravens. If Kroft is sidelined for a fifth consecutive contest, C.J. Uzomah's standing as the Bengals' clear No. 1 tight end would remain unchallenged. Kroft (foot) has been ruled out for Sunday's game against the Saints, Paul Dehner Jr. of The Cincinnati Enquirer reports. Analysis: With Kroft still out and Tyler Eifert (ankle) on IR, C.J. Uzomah (clavicle) will continue to head the Bengals' tight end corps Week 10 and possibly beyond if Kroft's foot issue persists. Kroft (foot) is still wearing a protective boot, Katherine Terrell of ESPN.com reports. Analysis: Kroft is recovering from a fractured right foot, and while the Bengals are optimistic he can return before the end of the season, it's safe to assume he won't be ready for Week 10 against the Saints. C.J. Uzomah figures to dominate snaps and targets at tight end. Kroft is still donning a protective boot on his fractured right foot and may not be close to returning to game action, Katherine Terrell of ESPN.com reports. Analysis: Coach Marvin Lewis said last week that he expects Kroft to play again at some point this season, but there does seem to be real chance the tight end doesn't make it back. He's recovering from an injury that may ultimately require surgery, leaving C.J. Uzomah to handle a three-down role in the meantime. Kroft can safely be ruled out for at least the Bengals' Week 8 game against Tampa Bay. Coach Marvin Lewis said Kroft (foot) likely will return to the team at some point this year, Geoff Hobson of the Bengals' official site reports. Analysis: It's still not clear if Kroft will go under the knife, but shutting him down for the season has been ruled out for the time being. Kroft would've been the second Bengals tight end to hit injured reserve, joining Tyler Eifert (ankle). Still, Kroft won't play Week 7 against the Chiefs and is likely still facing a multi-week absence. In the meantime, C.J. Uzomah will continue to be the No. 1 tight end, with Mason Schreck and Matthew Lengel on hand for any lingering snaps. Kroft, who is inactive for Sunday's game against the Steelers, is dealing with a fractured bone in his right foot and could require surgery, Adam Schefter of ESPN.com reports. Kroft (foot) has been ruled out for Sunday's game against the Steelers, Katherine Terrell of ESPN.com reports. Analysis: The news comes as no surprise, as Kroft was seen sporting a walking boot Wednesday and getting around the Bengals' locker room on a scooter. With Kroft out and Tyler Eifert (ankle) on IR, C.J. Uzomah will head the team's tight end corps Week 6 and possibly beyond if Kroft's injury lingers. 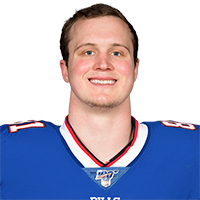 Kroft (foot) was listed as a non-participant at Thursday's practice, Paul Dehner Jr. of The Cincinnati Enquirer reports. Analysis: Kroft has started Week 6 preparations with back-to-back absences from practice and was spotted with a walking boot on his right foot Wednesday, suggesting he's in serious danger of missing Sunday's game against the Steelers. The 25-year-old could alter his outlook for the better with any involvement in Friday's practice, but for now, C.J. Uzomah looks poised to handle the majority of tight-end snaps this weekend. Kroft (foot) didn't practice Wednesday, Katherine Terrell of ESPN.com reports. Analysis: The news comes as no surprise after previous reports noted that Kroft was sporting a walking boot Wednesday and getting around the Bengals' locker room on a scooter. If Kroft is unable to play Sunday against the Steelers, C.J. Uzomah would have a clear path to an overwhelming share of snaps at tight end. Kroft, who exited Sunday's 27-17 loss to the Dolphins with a right foot injury, was sporting a walking boot Wednesday and navigating around the Bengals' locker room on a scooter, Paul Dehner Jr. of The Cincinnati Enquirer reports. Kroft left Sunday's game against the Dolphins with a right foot injury and is questionable to return. Analysis: The Bengals were already in dire straits at tight end, having lost Tyler Eifert for the season last week. Now they're down to C.J. Uzomah and Mason Schreck at the position if Kroft can't return. Kroft is in line to play more often now that Tyler Eifert (leg) is out for the season, Jay Morrison of The Athletic reports. Kroft only has four catches on five targets through the first four games this season and was shut out Sunday against the Falcons. Analysis: As Kroft's Week 4 stat line might indicate, it's not a given that Kroft will be the next man up in the wake of Eifert's injury. That could pivot to C.J. Uzomah instead. Uzomah has more catches, targets and offensive snaps than Kroft this season, though that dynamic could change now that Eifert is out as the starter. Kroft hauled in his only target for 16 yards during Sunday's 31-21 loss to the Panthers. Analysis: It was another quiet outing for Kroft, who was on the field for just 32 percent of the team's offensive snaps. Meanwhile, fellow tight ends Tyler Eifert and C.J. Uzomah both played over 50 percent of the snaps and were more involved in the passing game. Through three games, Kroft has four receptions for 36 yards and no touchdowns. 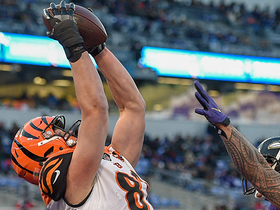 Kroft had two catches for 11 yards in the Bengals' win over the Ravens on Thursday. Analysis: On the bright side, Kroft doubled his snap count from 17 to 34. On the increasingly dour side, he was in there to block on many of those snaps, and third-string tight end C.J. Uzomah was more active in the passing game. Kroft is waiver bait unless and until Tyler Eifert gets hurt again. Kroft had just one catch for nine yards on his only target in Sunday's win over the Colts. Analysis: With Tyler Eifert on the field, Kroft saw just 17 offensive snaps against the Colts. This might not be an anomaly either. Eifert is clearly the top tight end option on the team when healthy, and the Bengals now have three viable wideouts. Kroft (undisclosed) returned healthy for training camp, Geoff Hobson of Bengals.com reports. Analysis: Kroft was held out of June minicamp but never seemed to be in much danger of missing the start of training camp. He figures to get most of the first-team reps until Tyler Eifert (back) is removed from the PUP list. Given Eifert's lengthy injury history, there's a decent chance Kroft will have an opportunity to build on his breakout 2017 campaign. Kroft missed mandatory minicamp due to an undisclosed issue but is expected to return healthy for the start of training camp, Geoff Hobson of the Bengals' official site reports. Kroft had six receptions for 53 yards and a pair of touchdowns in Sunday's 31-27 win over the Ravens. Analysis: Kroft exploded in the first half with five catches for 50 yards and both touchdowns, but fell silent in the second half with the rest of the Bengals offense. It's the first time since Week 9 the 25-year-old had more than 30 receiving yards and was his first touchdown since Week 12. The return of Tyler Eifert (back) in 2018 should limit Kroft's fantasy potential as he heads into the final year of his rookie contract. Kroft had two catches for one yard on four targets in Sunday's loss to the Vikings. Analysis: Kroft had been banged up in practice, yet still received 47 snaps on game day. The entire Bengals offense was once again a no-show, so it's no surprise that Kroft was personally quiet. Kroft (hamstring) turned in a full practice Friday and doesn't have an injury designation for Sunday's game against the Vikings. Analysis: Kroft's full practice cleared up any concern the Bengals' coaching staff might have had about the tight end's health heading into the weekend. While Kroft should start and see the bulk of the snaps at tight end Sunday, he hasn't been a primary option in the Bengals' passing attack in recent weeks. Over the team's last five games, Kroft has hauled in eight of 16 targets for 60 yards and two scores. Kroft (hamstring) returned to a limited practice Thursday, Geoff Hobson of the Bengals' official site reports. Analysis: After missing Wednesday's practice, Kroft is trending in the right direction as Sunday's game against the Vikings approaches. Added clarity regarding his playing status will arrive Friday, though at this stage it remains to be seen if the tight end draws a questionable designation, or is removed altogether from the Bengals' final Week 15 injury report. Kroft (hamstring) did not practice Wednesday. Analysis: Though Kroft was on the field for 45 of 54 snaps on offense in this past Sunday's 33-7 loss to the Bears, he did not catch a pass in the contest. That's two straight quiet fantasy efforts for the tight end, who looks like a TD-dependent dart Sunday against the Vikings, that is if he is able bounce back quickly from his hamstring issue. Kroft did not see a target during Sunday's 33-7 loss to Chicago. Analysis: It wasn't as if Kroft was glued to the bench. He saw the field for 45 of Cincinnati's 54 offensive plays. This is probably a continuation of the Rutgers product's diminished role in the offense. The Bengals have focused throws to A.J. Green and Brandon LaFell, who saw 18 targets combined Sunday. Kroft, meanwhile, has two or fewer catches in five of his last six games. Hop off this wagon while you still can. Kroft caught both of his targets for 30 yards during Monday's 23-20 loss to the Steelers. Kroft was a full participant in practice Friday, Paul Dehner Jr. of The Cincinnati Enquirer reports. Analysis: The wrist injury limited Kroft's participation during the Bengals' first practice of the week Thursday, but the tight end's full session a day later suggests he's in no danger of missing Monday's matchup with the Steelers. 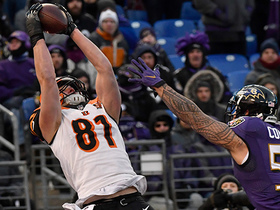 Like Tyler Eifert (back) before him, Kroft has emerged as a favorite red-zone target of quarterback Andy Dalton this season, reeling in five touchdown receptions over the Bengals' last eight contests. Kroft (wrist) was limited at Thursday's practice, the Dayton Daily News reports. Analysis: Per the report, Kroft's wrist injury dates back to Week 11's game against the Broncos, but it's an issue the tight end played through in this past Sunday's win over the Browns. While Kroft has hauled in just six passes for 30 yards over his last three outings, he has, at least, scored in the Bengals' last two games. He profiles a TD-dependent fantasy dart in Week 13, while up against the Steelers' rugged pass defense Monday night. Kroft hauled in three of four targets for 14 yards and a touchdown in Sunday's 30-16 defeat of the Browns. 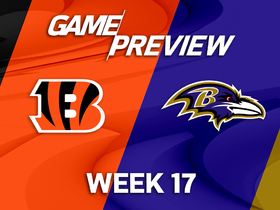 Analysis: The third-year vet caught a one-yard TD pass from Andy Dalton to end the first drive of the third quarter and put the Bengals up 23-6. The 25-year-old's three receptions were his most since Week 8. He is a low-floor tight end whose fantasy upside depends on whether he finds the end zone in a given week. It will be difficult to count on him in Week 13 against Pittsburgh, or in subsequent contests against the Bears and Vikings, as all three teams have been tough against tight ends. Kroft (hand) practiced fully Thursday, Nate Ulrich of the Akron Beacon Journal reports. Analysis: Though Kroft has logged just three catches for 16 yards over his last two games, he did score in Week 11 against the Broncos. He's a reasonable lineup option at the tight end position in deeper formats this week, considering that he'll see plenty of snaps against a beatable Cleveland pass defense Sunday. Kroft (hand) was limited at Wednesday's practice. Kroft is questionable to return to Sunday's game at Denver due to a right hand injury. Analysis: The severity of the injury is unknown, but if Kroft is unable to return, he'll finish with two catches (on three targets) for 12 yards and one touchdown. The next men up at tight end for the Bengals are C.J. Uzomah and Ryan Hewitt. Kroft was held to one four-yard catch out of six targets in Sunday's 24-20 loss to Tennessee. Analysis: What's going on with Kroft? After four straight games with at least four catches, the third-year tight end has caught just two passes over the past two weeks. It wasn't for a lack of trying on Sunday as Andy Dalton looked Kroft's way six times but found friendlier confines on the outside to A.J. Green and Brandon LaFell. Expect Kroft to get more attention this coming week against Denver, a team that boasts lockdown cornerbacks but has struggled defending athletic tight ends this season. Kroft nabbed both of his targets for 79 yards in Sunday's 23-7 loss the the Jaguars. 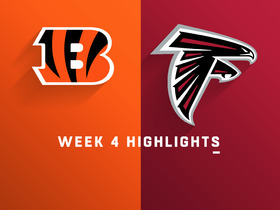 Watch the best highlights from the Week 4 match up between the Cincinnati Bengals and the Atlanta Falcons. 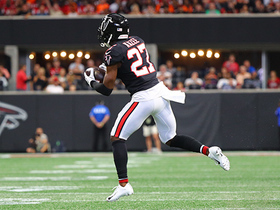 Atlanta Falcons defensive back Damontae Kazee intercepts Cincinnati Bengals quarterback Andy Dalton off a tipped pass. 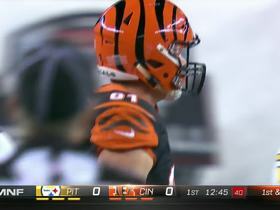 The Atlanta Falcons special teams come up with a block on the Cincinnati Bengals punter Kevin Huber and recover. 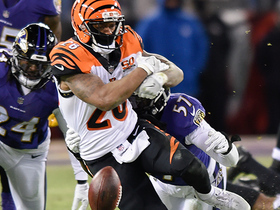 Watch the best plays of the Week 17 matchup between the Cincinnati Bengals and Baltimore Ravens. Baltimore Ravens linebacker C.J. 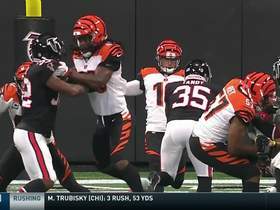 Mosley strips the ball from Bengals running back Joe Mixon forcing the turnover. 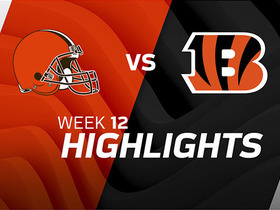 Watch all the highlights from the Cincinnati Bengals 30-16 victory over the Cleveland Browns in Week 12 of the 2017 NFL season.